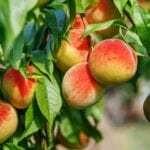 If you are looking for a cold hardy peach tree, try growing Frost peaches. What is a Frost peach? This variety is a partial freestone with classic peachy good looks and flavor. These peaches are yummy canned, in desserts or fresh out of hand. Continue reading for some helpful Frost peach information that can help you decide if this is the cultivar for you. What is a Frost Hardy Peach? Close your eyes and conjure up the scent of a fully ripe summer peach. There are few things like the abundant fruits of summer, and peaches are one of the best. A Frost peach produces medium to large fruits on a self-fruitful tree. Fruits are so abundant that tip pruning may have to occur to allow fruit space to develop. 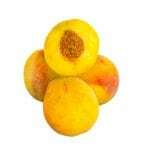 Frost peach grows in United States Department of Agriculture 5 to 9, making it one of the hardiest peaches available. It does bloom early, however, which may make fruit set difficult in areas with late freezes. Beautiful hot pink flowers occur in spring before the tree develops leaves. These cold hardy peaches grow 12 to 18 feet (3.6 to 6 m.) in height but semi-dwarf forms are available that only get 10 to 12 feet (3 to 3.6 m.). Pruning can help keep your Frost peach tree the height you require. The fruits are slightly blushed over greenish yellow to yellow skin and have yellow-orange flesh and a semi-clinging stone. The Frost peach tree requires 700 chill hours to break dormancy and set fruit. It is resistant to peach leaf curl and root knot nematodes. It is, however, susceptible to oriental fruit moths, brown rot and peach twig borer. They are extremely adaptable plants that will start bearing 3 to 5 years after planting. By the time the tree is mature at 8 to 12 years, it will produce its peak crops. Blooming occurs in mid-March to April and fruits are generally ready in mid to late August. Peaches don’t store for long, so staggered plantings of varieties that ripen at different times are suggested. These cold hardy peaches are great canned, however, so a bumper crop won’t go to waste. 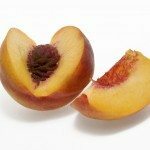 Peaches prefer a site with full sun and well-draining soil. They can thrive in almost any soil type as long as it doesn’t get boggy. Fertilize once per year in early spring. Use organic mulch around the root zone to preserve moisture and prevent weeds. 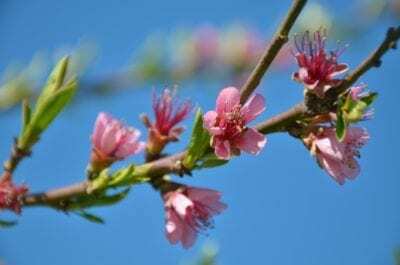 Peach trees need regular pruning to promote air flow and enhance cropping. You can remove old, dead or diseased wood at any time of the year, but maintenance pruning is done in spring just at bud swell. Remove the old, gray shoots that will not fruit and leave the reddish young growth. Peaches fruit on 1-year growth and can be pruned hard annually. If necessary, once fruit begins to form, nip off a few in each developing group to promote bigger peaches.